Mario Draghi, President of the European Central Bank (ECB), offered a cautious and Dovish press conference following today’s monetary policy decision. This decision saw all three headline monetary rates remain constant, whilst net asset purchases were maintained at €60bn. This article analyses the market’s reaction to this move in addition to the new European macroeconomic impression that has manifested following this conference. Immediately below, we present a chart of the performance of the Euro against both the United States Dollar (USD) and the Great British Pound (GBP). 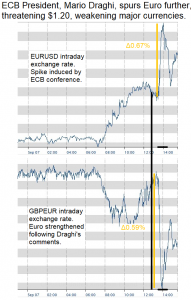 The graphs show considerable appreciation of the Euro following the press conference at 13:30 BST, the duration of which is marked with a horizontal black line, and a moderate devaluation following the decision release demarked by the vertical line. The graph above shows the EURUSD exchange rate above the GBPEUR rate. The apparent inverse correlation between the two charts shows that the causal influence, unsurprisingly, lies within the Euro and thus the ECB’s actions. We live tweeted the progression of Draghi’s press conference on our twitter site. The set of prospective key announcements that would have appreciated the Euro included an announcement of the immediate or planned tapering of the asset purchase plan, Quantitative Easing (QE). Alternatively, because forecasts were released simultaneously within the press conference, an increased forecast of either inflation or economic growth would have rallied the Euro. What would have depreciated the Euro against these major currency pairs is an active and clear attempt to talk down the currency. Draghi may have had an incentive to pursue this option due to the deflationary pressure that the sustained and rapid appreciation of the Euro has generated within the Eurozone. Ultimately, in contrast to his recent Jackson Hole and Lindau speeches, Draghi did make reference to the exchange rate. However, the Dovish stance towards the exchange rate were clearly insufficiently grave in order to either worry investors or deter from the forward planning advice that the decision also contained. Live analysis, however, did identify investors’ fears for a split second when the topic arose. Instead of condemning the Euro’s strength, Draghi instead signalled that whilst a plan was not yet in place, the QE program would remain throughout this and the next year, with further details on tapering likely to be released in October. Confidence in the gradual tapering and eventual cessation of the asset purchasing program attracted capital to the Euro, thereby increasing its relative value. QE, often alluded to as the printing of money, involves the purchasing of assets by the central bank in order to stimulate the economy. The purchase with new (but not printed) money raises the aggregate money supply, M3. Given that an exchange rate price level is equal to the rate at which supply and demand clear or equilibrate, QE is clearly responsible for artificially constraining the value of a currency. Therefore, plans for its curtailment or withdrawal signals to investors the likelihood of a future increase in the currency’s value. This signal generates an expectation of future value enticing investors to purchase the currency (and assets therein). The money demand therefore increases, raising the price level in anticipation of the impending constraint upon the money supply. The current program of QE ends with 2017, therefore, a new plan must be generated in order to facilitate the continuation and eventual tapering of QE. Given that the ECB only has two scheduled monetary policy decisions remaining between now and 2018, either one of these meetings must present a finalised asset purchasing program. Draghi alluded to October as the meeting within which the majority of arrangements should be formalised and presented. As the Euro continued to appreciate during the press conference, the pressure on Draghi and the ECB to counteract spill-over dis-inflationary pressures and the deteriorating competitiveness of Eurozone export will rise. Therefore, whilst for now Euro-strength only creates a “broad dissatisfaction tempered by the confidence that inflation will eventually converge”, markets will debate the risk of a future backlash against the Euro’s strength. For the immediate future, however, positive sentiment supplemented with positive future economic forecasts paves the way for a strong Euro.